When gh-ost came out, I was very excited. 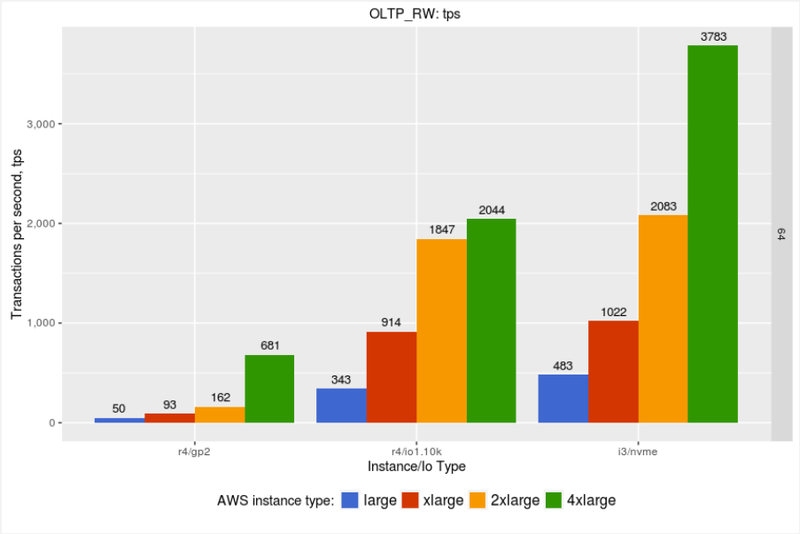 As MySQL ROW replication became commonplace, you could use it to track changes instead of triggers. This practice is cleaner and safer compared to Percona Toolkit’s pt-online-schema-change. Since gh-ost doesn’t need triggers, I assumed it would generate lower overhead and work faster. I frequently called it “pt-online-schema-change on steroids” in my talks. Finally, I’ve found some time to check my theoretical claims with some benchmarks. DISCLAIMER: These benchmarks correspond to one specific ALTER TABLE on the table of one specific structure and hardware configuration. I have not set up a broad set of tests. If you have other results – please comment! The table size is about 3GB (completely fitting to innodb_buffer_pool). This is important as this workload is heavily commit-bound, and extensively relies on group commit. 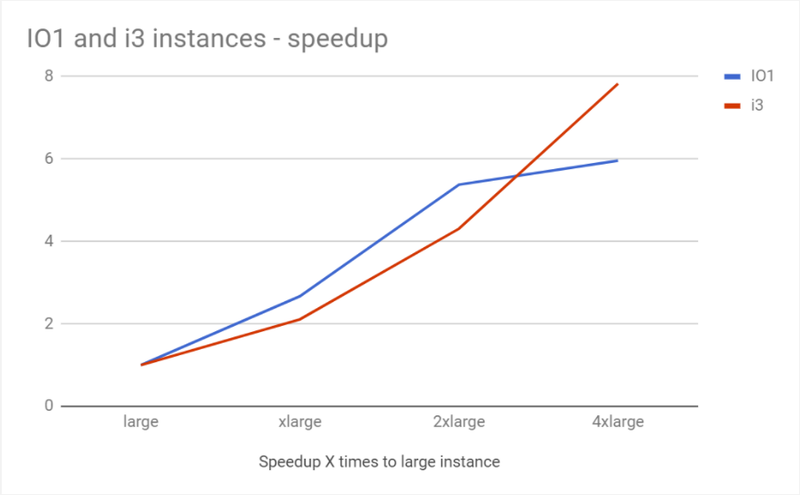 I measured the alter table completion times for all cases, as well as the overhead generated by the alter (in other words, how much peak throughput is reduced by running alter table through the tools). 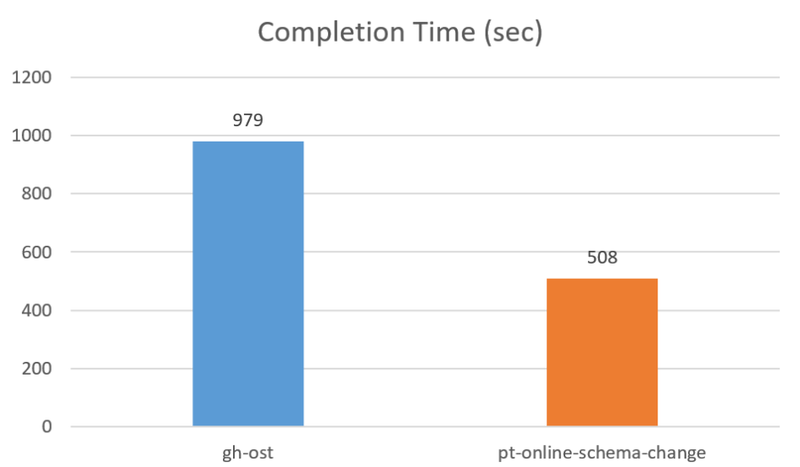 For the Idle Load test, pt-online-schema-change completed nearly twice as fast as gh-ost. This was a big surprise for me. I haven’t looked into the reasons or details yet, though I can see most of the CPU usage for gh-ost is on the MySQL server side. 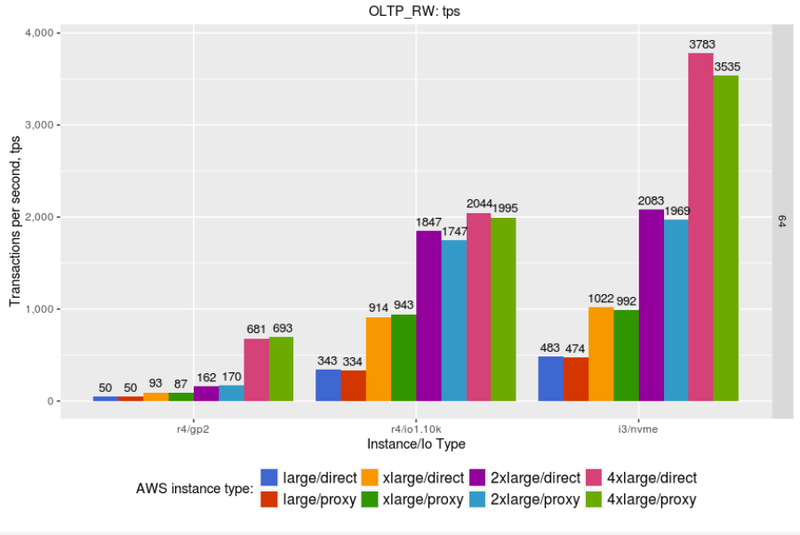 Perhaps the differences relate to the SQL used to perform non-blocking alter tables. value to scale it for your system. 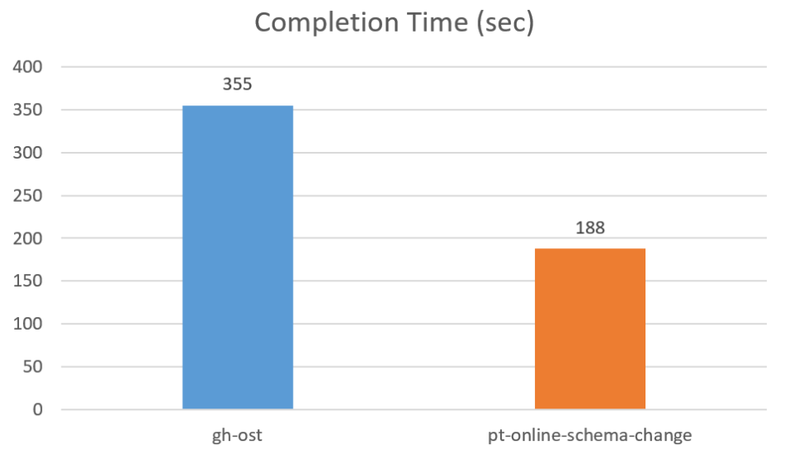 The numbers changed (as expected), but pt-online-schema-change is still approximately twice as fast as gh-ost. What is really interesting in this case is how a relatively light background load affects the process completion time. It took both pt-online-schema-change and gh-ost about 2.7x times longer to finish! What happened in this case? When the load gets higher, gh-ost can’t keep up with binary log processing, and just never finishes at all. While this may be surprising at first, it makes sense if you think more about how these tools work. pt-online-schema-change uses triggers, and while they have a lot of limitations and overhead they can execute in parallel. gh-ost, on the other hand, processes the binary log in a single thread and might not be able to keep up. In MySQL 5.6 we didn’t have parallel replication, which applies writes to the same table in parallel. For that version the gh-ost limitation probably isn’t as big a deal, as such a heavy load would also cause replication lag. 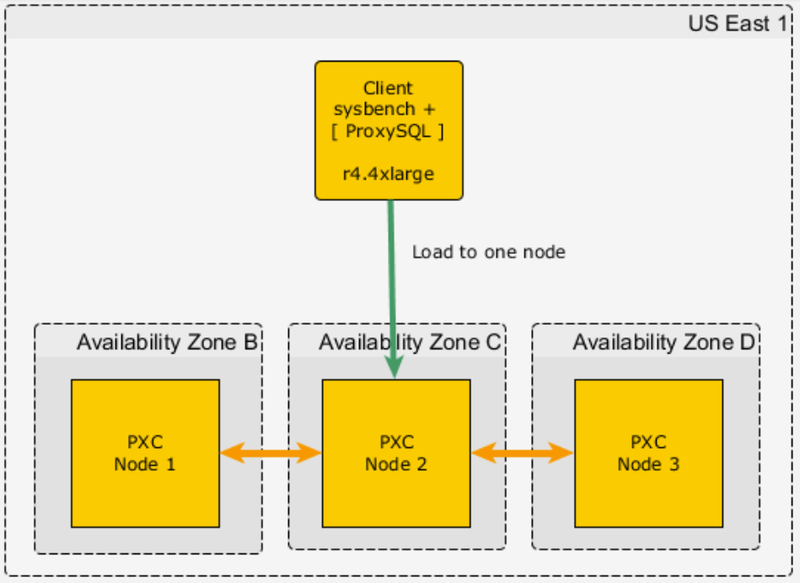 MySQL 5.7 has parallel replication. 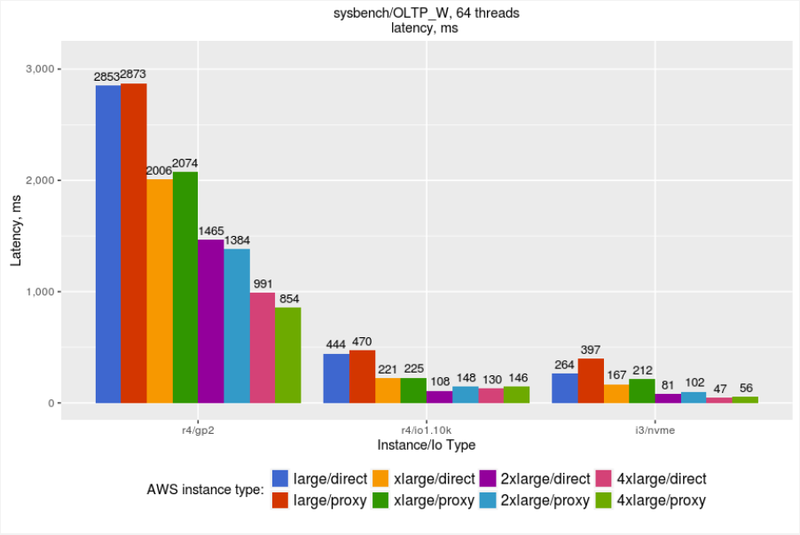 This makes it much easier to quickly replicate workloads that are too heavy for gh-ost to handle. I should note that the workload being simulated in this benchmark is a rather extreme case. The table being altered by gh-ost here is at the same time handling a background load so high it can’t be replicated in a single thread. Future versions of gh-ost could improve this issue by applying binlog events in parallel, similar to what MySQL replicas do. 2017-06-25 19:16:05 ERROR parsing time "" as "2006-01-02T15:04:05.999999999Z07:00": cannot parse "" as "2006"
As we can see, gh-ost has negligible overhead in this case. pt-online-schema-change on the other hand, had peformance reduced by 12%. It is worth noting though that pt-online-schema-change still makes progress in this case (though slowly), while gh-ost would never complete. 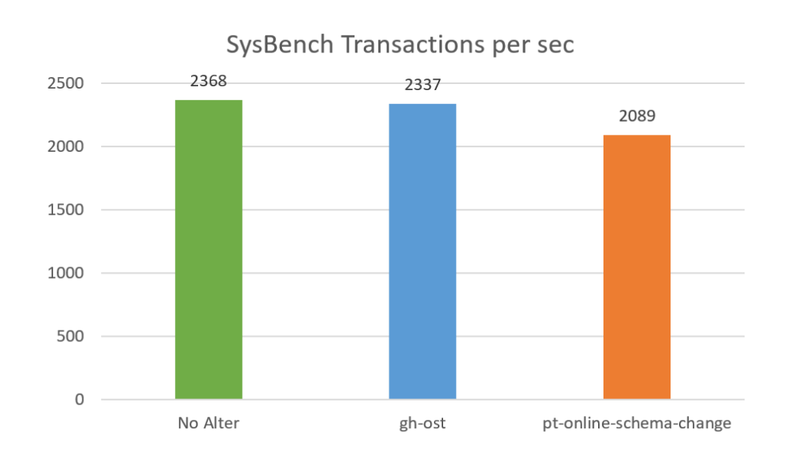 If anything, I was surprised at how little impact the pt-online-schema-change run had on sysbench performance. It’s important to note that in this case we only measured the overhead for the “copy” stage of the online schema change. Another thing you should worry about is the impact to performance during “table rotation” (which I have not measured). 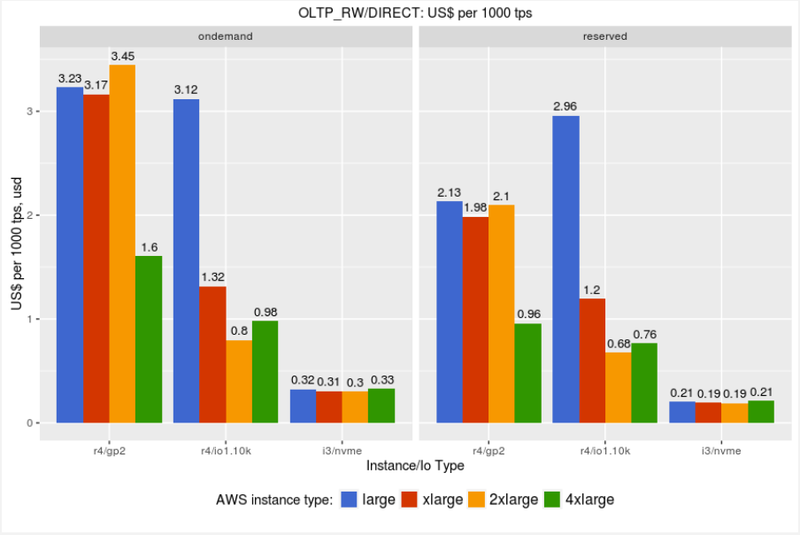 While gh-ost introduces a number of design advantages, and gives better results in some situation, I wouldn’t call it always superior the tried and true pt-online-schema-change. 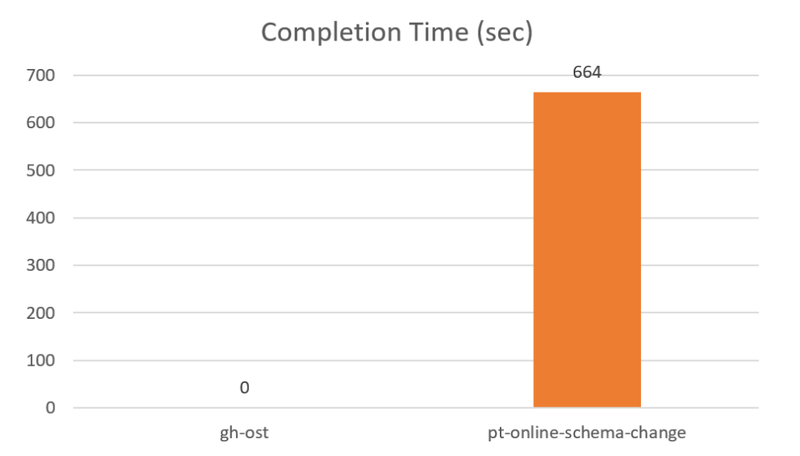 At least in some cases, pt-online-schema-change offers better performance than gh-ost and completes a schema change when gh-ost is unable to keep up. Consider trying out both tools and see what works best in your situation. For this blog post, I’ve decided to try ClickHouse: an open source column-oriented database management system developed by Yandex (it currently powers Yandex.Metrica, the world’s second-largest web analytics platform). 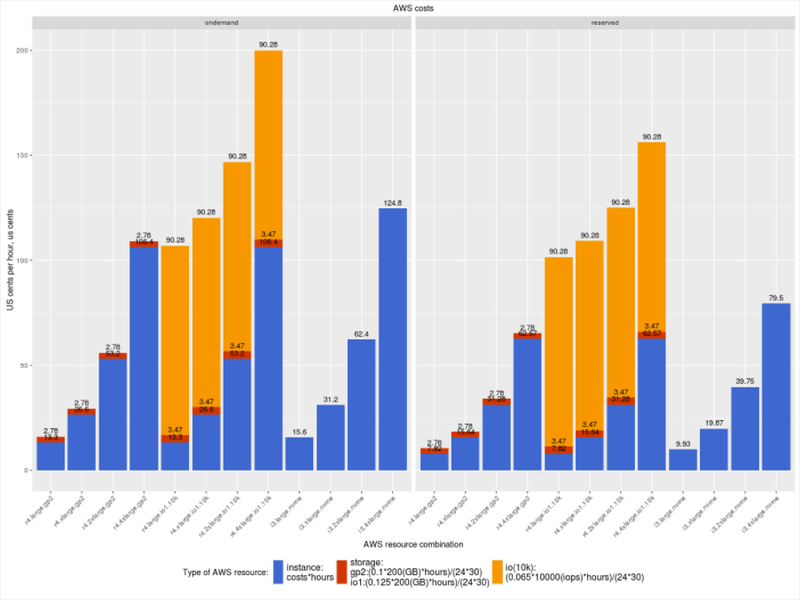 In my previous set of posts, I tested Apache Spark for big data analysis and used Wikipedia page statistics as a data source. 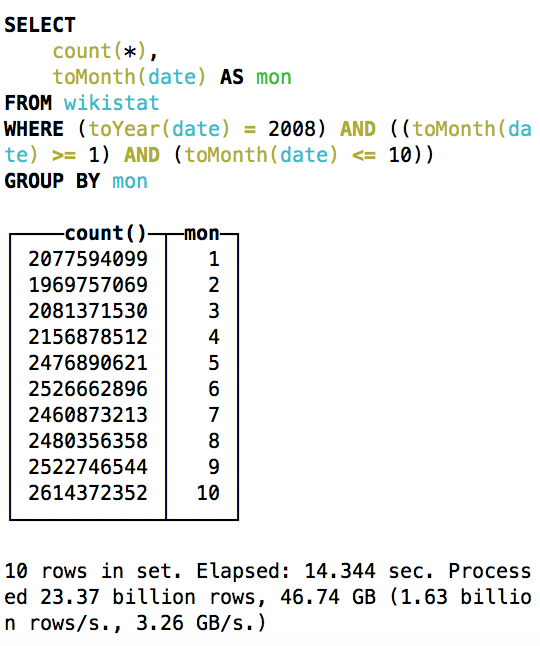 I’ve used the same data as in the Apache Spark blog post: Wikipedia Page Counts. 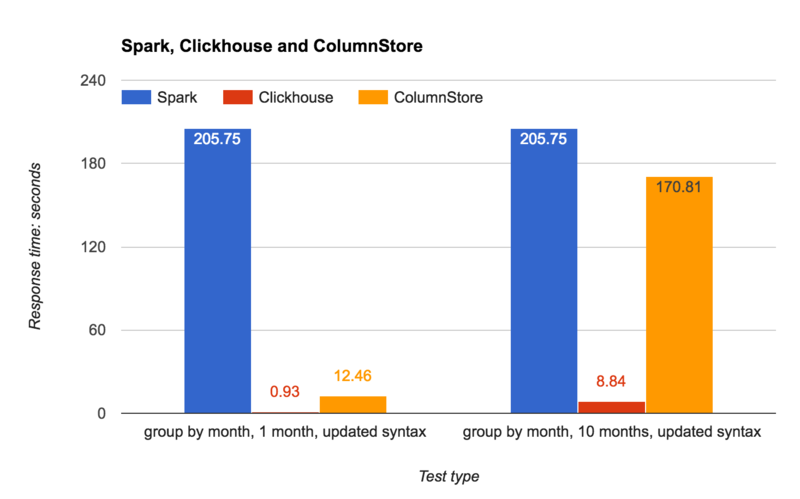 This allows me to compare ClickHouse’s performance to Spark’s. Limited SQL support, and the joins implementation is different. If you are migrating from MySQL or Spark, you will probably have to re-write all queries with joins. Code: 241. DB::Exception: Received from localhost:9000, 127.0.0.1. Both ClickHouse and Spark can be distributed. 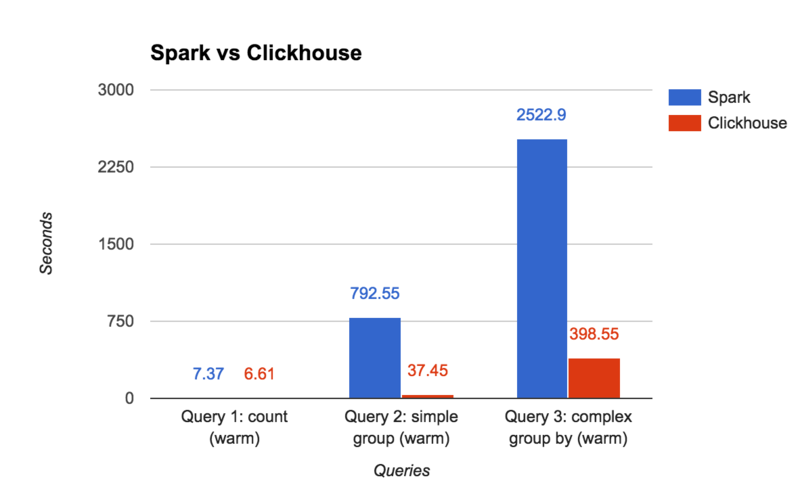 However, for the purpose of this test I’ve run a single node for both ClickHouse and Spark. The results are quite impressive. Storing terabytes of data and querying (“crunching” would be a better word here) data without an index. 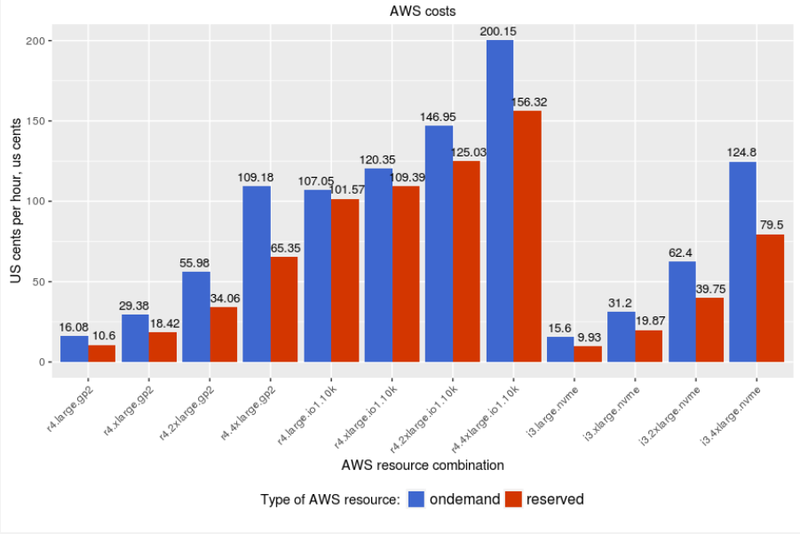 It would take weeks (or even months) to load data and build the indexes. That is a much more suitable workload for ClickHouse or Spark. Real-time updates / OLTP. ClickHouse does not support real-time updates / deletes. Usually big data systems provide us with real-time queries. Systems based on map/reduce (i.e., Hive on top of HDFS) are just too slow for real-time queries, as it takes a long time to initialize the map/reduce job and send the code to all nodes. 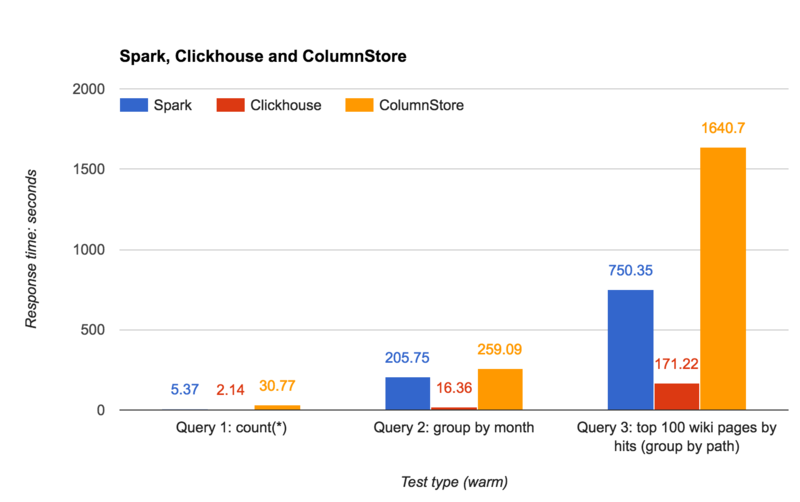 Potentially, you can use ClickHouse for real-time queries. It does not support secondary indexes, however. This means it will probably scan lots of rows, but it can do it very quickly. Scanning the whole table is significantly faster in ClickHouse. 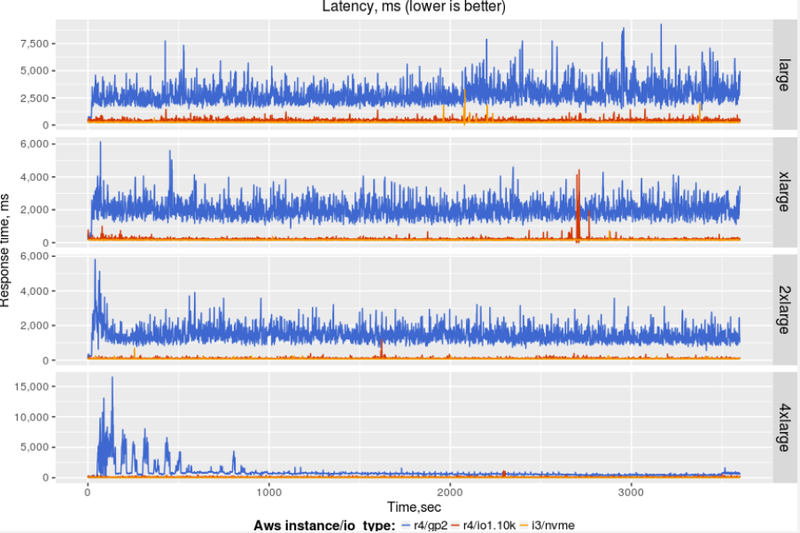 Retrieving just ten rows by key is faster in MySQL (especially from memory). 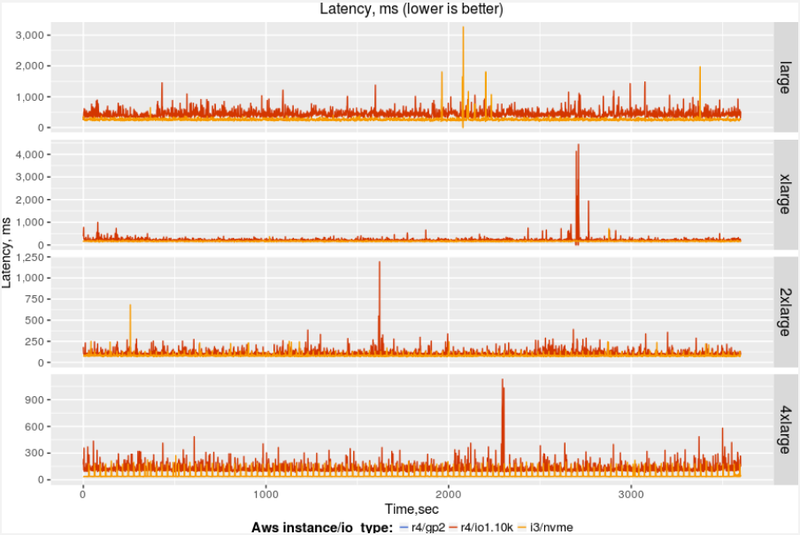 As we can see, even though ClickHouse scans more rows (270K vs. 11K – over 20x more) it is faster to execute the ClickHouse query (0.10 seconds in MySQL compared to 0.01 second in ClickHouse). 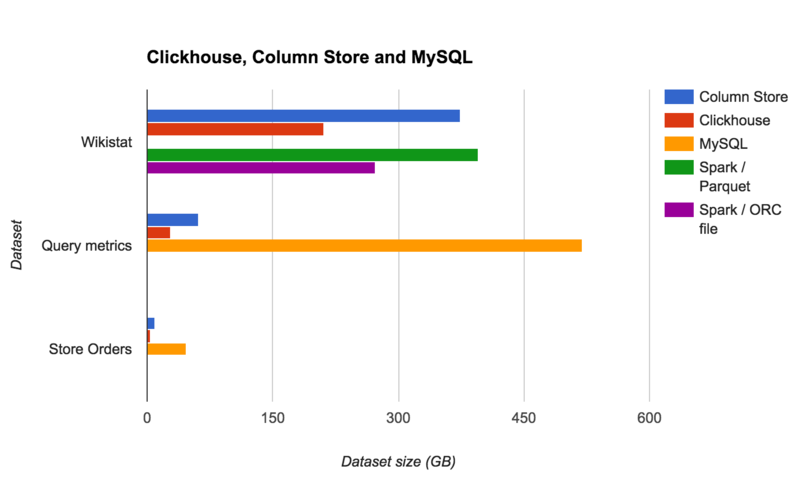 The column store format helps a lot here, as MySQL has to read all 150 columns (stored inside InnoDB pages) and ClickHouse only needs to read seven columns. Inspired by the article about finding trending topics using Google Books n-grams data, I decided to implement the same algorithm on top of the Wikipedia page visit statistics data. My goal here is to find the “article trending this month,” which has significantly more visits this month compared to the previous month. As I was implementing the algorithm, I came across another ClickHouse limitation: join syntax is limited. In ClickHouse, you can only do join with the “using” keyword. This means that the fields you’re joining need to have the same name. If the field name is different, we have to use a subquery.
? Heath_Ledger                                       ? 2 ? 0.0008467223172121601 ? 6.853825241458039 ?
? Cloverfield                                        ? 2 ? 0.0009372609760313347 ? 3.758937474560766 ?
? The_Dark_Knight_(film)                             ? 2 ? 0.0003508532447770276 ? 2.8858100355450484 ?
? Scientology                                        ? 2 ? 0.0003300109101992719 ? 2.52497180013816 ?
? Barack_Obama                                       ? 3 ? 0.0005786473399980557 ? 2.323409928527576 ?
? Canine_reproduction                                ? 3 ? 0.0004836300843539438 ? 2.0058985801174662 ?
? Iron_Man                                           ? 6 ? 0.00036261003907049 ? 3.5301196568303888 ?
? Iron_Man_(film)                                    ? 6 ? 0.00035634745198422497 ? 3.3815325090507193 ?
? Grand_Theft_Auto_IV                                ? 6 ? 0.0004036713142943461 ? 3.2112732008504885 ?
? Indiana_Jones_and_the_Kingdom_of_the_Crystal_Skull ? 6 ? 0.0002856570195547951 ? 2.683443198030021 ?
? Tha_Carter_III                                     ? 7 ? 0.00033954377342889735 ? 2.820114216429247 ?
? EBay                                               ? 7 ? 0.0006575000133427979 ? 2.5483158977946787 ?
? Bebo                                               ? 7 ? 0.0003958340022793501 ? 2.3260912792668162 ?
? Facebook                                           ? 7 ? 0.001683658379576915 ? 2.16460972864883 ?
? Yahoo!_Mail                                        ? 7 ? 0.0002190640575012259 ? 2.1075879062784737 ?
? MySpace                                            ? 7 ? 0.001395608643577507 ? 2.103263660621813 ?
? Gmail                                              ? 7 ? 0.0005449834079575953 ? 2.0675919337716757 ?
? Hotmail                                            ? 7 ? 0.0009126863121737026 ? 2.052471735190232 ?
? Google                                             ? 7 ? 0.000601645849087389 ? 2.0155448612416644 ?
? Barack_Obama                                       ? 7 ? 0.00027336526076130943 ? 2.0031305241832302 ?
? Facebook                                           ? 8 ? 0.0007778115183044431 ? 2.543477658022576 ?
? MySpace                                            ? 8 ? 0.000663544314346641 ? 2.534512981232934 ?
? Two-Face                                           ? 8 ? 0.00026975137404447024 ? 2.4171743959768803 ?
? YouTube                                            ? 8 ? 0.001482456447101451 ? 2.3884527929836152 ?
? Hotmail                                            ? 8 ? 0.00044467667764940547 ? 2.2265750216262954 ?
? The_Dark_Knight_(film)                             ? 8 ? 0.0010482536106662156 ? 2.190078096294301 ?
? Google                                             ? 8 ? 0.0002985028319919154 ? 2.0028812075734637 ?
? Joe_Biden                                          ? 9 ? 0.00045067411455437264 ? 2.692262662620829 ?
? The_Dark_Knight_(film)                             ? 9 ? 0.00047863754833213585 ? 2.420864550676665 ?
? Sarah_Palin                                        ? 10 ? 0.0012459220318907518 ? 2.607063205782761 ?
? Barack_Obama                                       ? 12 ? 0.0034487235202817087 ? 15.615409029600414 ?
? George_W._Bush                                     ? 12 ? 0.00042708730873936023 ? 3.6303098900144937 ?
? Fallout_3                                          ? 12 ? 0.0003568429236849597 ? 2.6193094036745155 ? Their response time is really good, considering the amount of data it needed to scan (the first query scanned 2.57 TB of data). 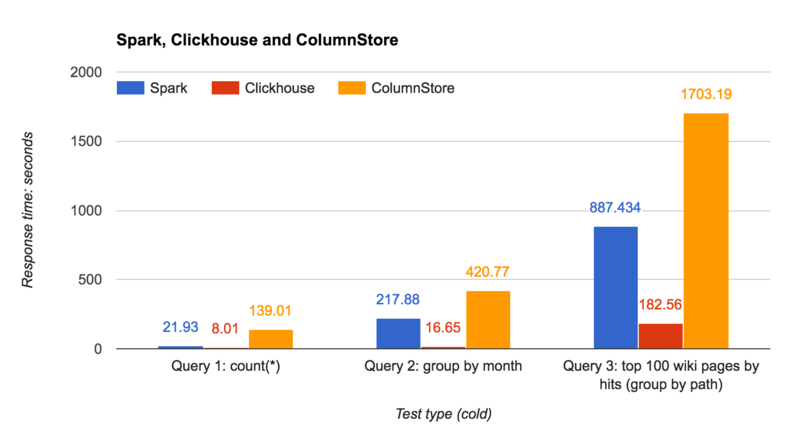 The ClickHouse column-oriented database looks promising for data analytics, as well as for storing and processing structural event data and time series data. 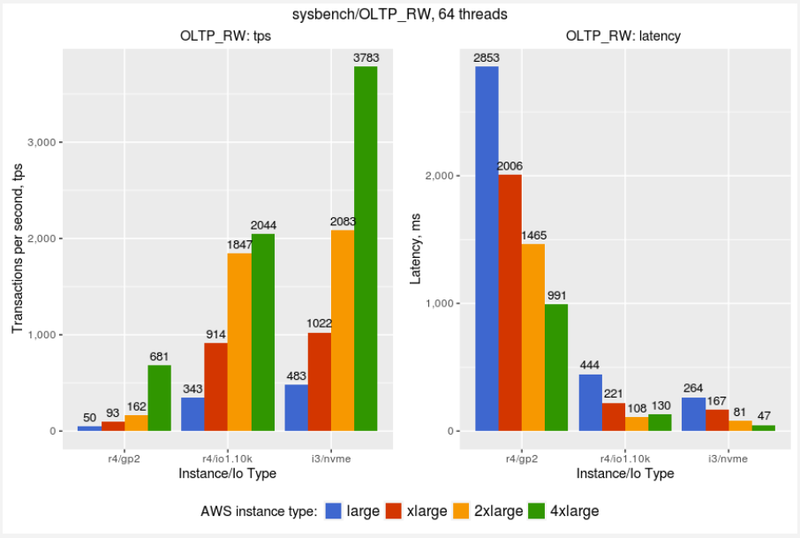 ClickHouse can be ~10x faster than Spark for some workloads.
? 2100162604 ? 1 ?
? 2489723244 ? 7 ?
? Special:Search                                      ? 44795 ? 4544605711 ? 101453.41 ?
? Main_Page                                           ? 31930 ? 2115896977 ? 66266.74 ?
? Special:Random                                      ? 30159 ? 533830534 ? 17700.54 ?
? Wiki                                                ? 10237 ? 40488416 ? 3955.11 ?
? Special:Watchlist                                   ? 38206 ? 37200069 ? 973.67 ?
? YouTube                                             ? 9960 ? 34349804 ? 3448.78 ?
? Special:Randompage                                  ? 8085 ? 28959624 ? 3581.9 ?
? Special:AutoLogin                                   ? 34413 ? 24436845 ? 710.11 ?
? Facebook                                            ? 7153 ? 18263353 ? 2553.24 ?
? Wikipedia                                           ? 23732 ? 17848385 ? 752.08 ?
? Barack_Obama                                        ? 13832 ? 16965775 ? 1226.56 ?
? index.html                                          ? 6658 ? 16921583 ? 2541.54 ?